Of the thousands of photos I’ve taken on golf courses, it’s one of my favorites. It was early morning and we were staging at the Whistling Straits clubhouse, getting ready to head out onto the Irish Course for a morning round on Pete Dye’s “other” design at Destination Kohler. As we prepared our golf bags and rolled a few practice putts, I took a moment to survey the Straits Course as the sunrise fired up its long-shadow light show on the famed finishing hole. Everything was colored that wonderful, dew-glistening greenish-gold that can only be captured by camera for a few minutes on the best of mornings, framed by rich late-summer hues intensifying the surrounding trees, bunkers, native grasses and reflection off the stunning stone building that provides a tip o’ the cap to the courses of Ireland, which served as muse for the masterpiece this piece of ground has become. This was Whistling Straits in a single camera shot. Stunning. Intimidating. Impeccably manicured. All with Lake Michigan on the horizon — a view so expansive that I more than once referred to the big blue as “the ocean” during our all-too-brief two-day visit to Wisconsin’s No. 1 golf destination. We had played the Straits the previous day. Mother Nature had bestowed a late-afternoon performance upon us — equal parts drizzle, wind and cloud-infused blue skies culminating in a mix of glorious sunshine through giant raindrops as we walked the final fairway with the sun headed for the horizon. It remains one of my more memorable days on a golf course. Certainly not because of my golf game but because I’ve encountered few settings in my golf travels that rival the nexus of terrain, vistas and design found in these entertaining golf holes moving in and out and along this stretch of coastline. It was a revelation — a surprising revelation. In more than a decade of writing about some of the game’s greatest destinations across the United States and around the world, I’d never acquired the desire to put Whistling Straits on my personal bucket list. And I still can’t explain why. I had watched with golf fans everywhere as television showcased the course while Vijay Singh won the PGA Championship in 2004. And again the beauty was on full display in 2010 even though controversy clouded eventual winner Martin Kaymer’s victory over bunker-busted Dustin Johnson. And few major championship venues have ever looked better in high definition than Whistling Straits in 2015 as Jason Day set fire to the record books with his mind-boggling 20-under-par Wanamaker-winning performance. I knew the 2007 U.S. Senior Open had been contested there, and that Kohler would be hosting its own “war by the shore” when the Ryder Cup arrives in 2020. Secret Golf's Steve Elkington travels Wisconsin to play Whistling Straits and visit Herb Kohler. He also visits Sartori Cheese, Wisconsin-based manufacturer of award-winning specialty cheese. And I knew I was crazy. 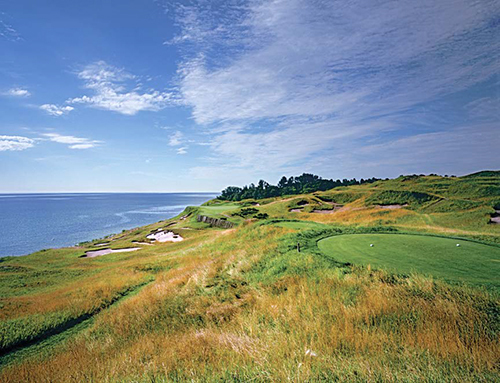 On a purely academic level, Whistling Straits has to be on every golfer’s must-play list, right? But, still, the course never resonated in my golfing soul. Maybe it was because I’m an ocean-golf snob. Or a links-golf snob. Sure, it was beautiful, but it always looked far too hard for the “average” golfer (despite how easy Day made it look for the pros). I still can’t offer a good reason. Looking back, it makes no sense — it’s almost embarrassing that I had to be persuaded to visit Whistling Straits and The American Club. Because what I found was flat-out fun from the moment I stepped off the first tee until hitting my last iron at the flag, swinging and walking the final 150 yards through that refreshing final-shot shower. In the five hours in between, I under-stood what I’d been missing. There were cliff-hanging 3-pars with names like O’Man, Shipwreck, Pop Up and Pinched Nerve — each a heroic one-shotter with the potential to make memories or destroy your scorecard. Plus, there’s the actual hole named Cliff Hanger — the par-4 13th where from the green you can almost see the fish in the Great Lake. And then there was the greenside bunker on the par-4 No. 6, which might be better described as an inside-the-green bunker because the putting sur-face literally wraps around this narrow, coffin-like pit that the caddies warn to avoid at all costs (I didn’t and paid the price with multiple swings and a big number, but it was some of the most fun I’ve had in a bunker in years). More importantly, I was struck by how much of the golf course felt perfectly natural — especially for an architect who through the years has taken a bad rap for “manufacturing” golf holes rather than allowing the land to carry the design. All but one hole (and I’ll let you discover for yourself which one) at Whistling Straits feel as though they have always been there, just waiting to be discovered or uncovered. There’s no doubt it’s hair-raising, swashbuckling golf, but from my perspective the best courses in the world all have that living-on-the-edge mentality (both literally and figuratively). The next morning on the Irish (a fine course in its own right), we’d find ourselves walking along with bell-ringing sheep and enjoying the spectacular morning, but I have to admit — every time I caught a glimpse of the Straits over the dunes that separate the two courses, I found myself wishing for one more round, one more chance at glory, one more opportunity to redeem my golf swing and write a sequel to this chapter of my own golf history. Whistling Straits is now on my must-return list. Until then, I look at that perfect photograph of the 18th at sunrise every day and wonder when I’ll get back — and why it took me so long to go in the first place. 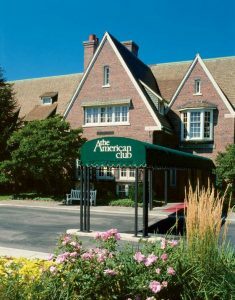 The American Club at Destination Kohler exudes hospitality as well as any resort you’ll find the United States. The rooms are upscale country-cozy, and the bathrooms (complete with Kohler showers, tubs, fixtures, you name it) are pure luxury — making it one of those “places to stay” where you’ll have a true internal struggle between exploring the great outdoors or retreating to the (also) great indoors. When it comes to dining, options are many but we love the friendly, cool-vibe Horse & Plow bar and grill for its comfort food with a twist, including burgers, fish ’n’ chips, pretzel bites and all sorts of other goodies (Beer & Cheese Soup, anyone?). Plus TVs, a fireplace and comfy lounge furniture make it a sweet spot to swap golf stories after a long day on the modern links. And speaking of Whistling Straits, if you’re looking to play the resort’s signature course, better plan to book early — tee times are in high demand (and demanding a high price around $500 when you include caddie fee and tip). Check out the resort’s Golf Escape stay-play packages to save a few bucks and experience golf at Blackwolf Run as part of your next golf getaway. Darin Bunch is travel editor for Golf News Net and co-host of the “Talking GolfGetaways” podcast available at www.GolfNewsNet.com and on the iTunes, audioBoom and Stitcher apps for mobile devices.